An Isometric Workout is clinically proven to be the safest and most effective form of resistance training around. In this article I'll outline the basis of a workout without movement and give you advice for constructing your own Isometric Training program. To start, just pick one exercise from each of these sections. You can add more in over time. Step 2) Schedule a consistent time EVERY DAY to do your Isometrics. Isometric exercises don't take a lot of time. 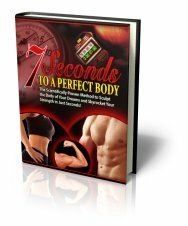 In fact you only need to contract a given muscle for 7-12 seconds (the reason and full technique is in 7 Seconds to A Perfect Body). I recommend first thing in the morning. Get it over and done with and you'll have achieved more in your morning than most. For now you don't have to contract that hard or intensely. Simply tense the target muscle until it begins to quiver and hold that tension for 7-12 seconds, then relax. JUST 1 MINUTE OF EXERCISE PER DAY - THAT'S AN EFFECTIVE ISOMETRIC WORKOUT! With each exercise you'll feel the blood rush into your muscles followed by a deep sense of relaxation that comes with each contraction and relaxation. It’s like stretching the whole body first thing in the morning! This is the way exercise and training is supposed to feel – a pleasant, enjoyable, experience that creates a feeling of invigoration, refreshment and achievement! This natural feel good vibe is the bodies way of encouraging you to do this more often!